As many of you have seen by now, acceptance and non-acceptance (I refuse to say rejection) letters went out to the 1,800+ QuiltCon entries this week. I submitted two quilts this year and I feel very humbled and lucky that both of them were accepted into the show given the roughly 20% acceptance rate. What I'm impressed about though is what I've been seeing on Instagram and online since these announcements. If you haven't already, go search the hashtag #quiltconreject and see all of the amazing quilts that were not selected to hang at QuiltCon this year. Impressive, right? What amazes me is the apparent quality of quilts that appears to have been accepted, but also those that were not. But what might be even more impressive is the response that both the accepted and non-accepted quilts are receiving. We all knew that this quilting community that we belong to is wonderful, but to see the KIND, SUPPORTIVE, ENCOURAGING words that we as quilters are leaving for each other is exactly the reason why I love being a part of this community. With this, I want to say THANK YOU to every one of you for being the type of person that we all strive to be and for encouraging all of us to continue with our journey. My Milky Way quilt will also be at QuiltCon 2016. This is the first year that I didn't have a quilt rejected at QuiltCon. In 2013 I submitted two and had one accepted. Last year I submitted five and had two accepted. Here's what I learned from that process that I want to share with you. When I took a look at all of the quilts that were accepted and in the show, I got why some of my quilts were not selected. Sometimes my quilts have more of a modern-traditionalism feel to them instead of a pure modern spin. You know what, I'm TOTALLY okay with that. When I look at the quilts that were accepted, I am so incredibly inspired by the talent, creativity and execution of the quilts in the show. You know what? I can say the same thing about all of the quilts that were not accepted either. With that I say to all of you - please keep doing what you do. You inspire me. 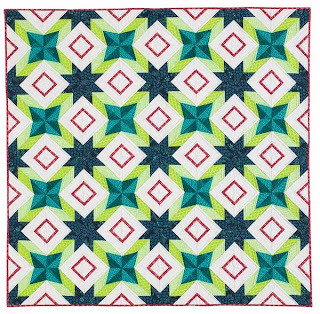 One of my 2015 QuiltCon "rejects" that I still LOVE! What I think I love most of all is the positive attitude of so many quilters that were not accepted into QuiltCon. I'm constantly reading about how quilters are okay with the fact that their quilt wasn't accepted because they still LOVE their quilt. And the positive comments and likes reaffirm that so many of us also love and enjoy your quilts as well. I know I've made multiple comments about loving quilts that were not juried into a show on Instagram. Because, let's face it, most of us are not show quilters. Is that really what modern quilting is about anyway? Our quilts are meant to be used and loved. They're an expression of who we are and where we are at a point in time in our lives. We should never be ashamed or disappointed about that. Own it! My Confetti quilt hung at QuiltCon 2015. I don't envy the judges and the tough decisions that they have to make. As we move closer to QuiltCon and the judging of the quilts, let's remember that they're human. As humans we're programmed to have opinions and they are all different. 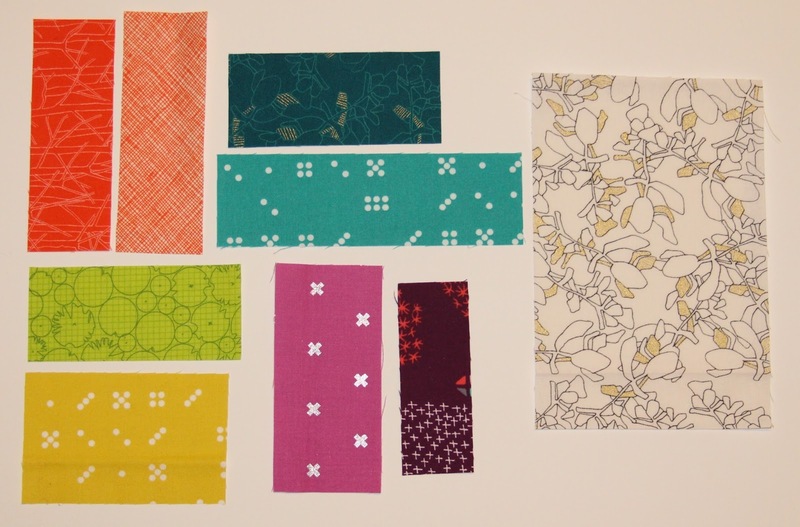 Let's embrace those differences, because those differences are what make our quilts unique. One person's preferred color palette may not be my preferred palette. I love color and and am not naturally drawn to earth tones. 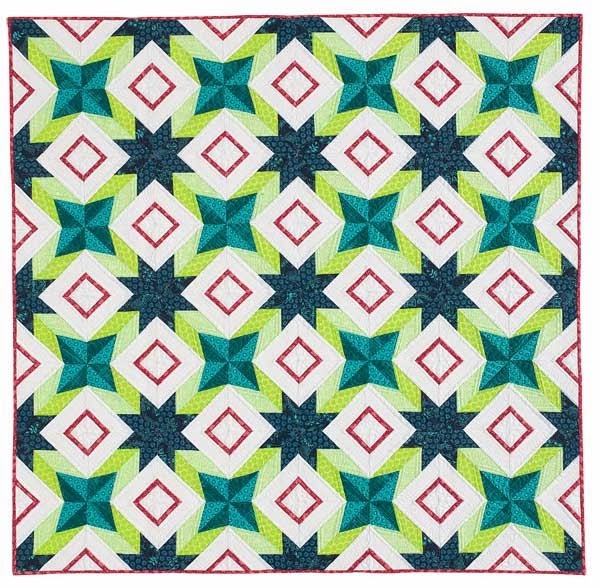 That being said, there are some incredibly amazing quilts out there that use those colors. I think and see things in repetitive patterns a lot and work with paper piecing frequently. While I occasionally work in improv, that process is much more of a stretch for me. To others, that comes naturally. It's those differences, unique perspectives that will continue to advance the modern quilt movement. My Mod Hex 2 quilt hung at QuiltCon 2015. There's always a ton of debate about what the modern quilt movement is all about and what makes a modern quilt. To me, that definition must always be fluid. One of the things that I observed is that a style of quilt that might have been accepted last year might not have made the cut this year. Take the pixilated quilt of a celebrity. Last year we saw those quilts hanging at QuiltCon but I've seen some of those in the #quiltconreject thread. Last year they were considered something new and unique. And guess what? They inspired many quilters to make their own version. That's awesome. BUT, if every modern quilt show had the same type of quilts in it, would that continue to evolve the modern quilt movement and push the limit of what we create? One of my #quiltconreject quilts from 2015. Here's my challenge to you, go back and compare the first quilt you made and the last quilt you made. My guess is that your styles have changed. Now go back and look at some of the quilts in the Fresh Modern Quilt group on Flickr and see some of the first quilts there vs. what we see today at QuiltCon. See the evolution? With that said, if you're goal is to get a quilt into QuiltCon 2017, my recommendation would be to look around you, at the quilts you see, the patterns and the colors of not just quilts, but life and draw inspiration from that. Now take that inspiration and push the envelope to do something that neither you or anyone else has done before. That, the creativity, the pushing of limits and the uniqueness is what modern quilting is all about and is what will help you get into QuiltCon if that's your end goal. Just continue to make quilts that you love though and you'll end up a winner regardless of the outcome. I love a good challenge to push me beyond my comfort zone as a way to try new things. Sometimes I'm less than enthusiastic about a challenge, but I forge ahead anyway as a way to try something new and maybe experiment with something I otherwise wouldn't have. That way, if it doesn't come out the way I want, I can just blame the challenge. I loved attending the inaugural QuiltCon in Austin a few years back and I was super bummed that I had class the weekend of QuiltCon this year. That's why when I knew I could attend QuiltCon Pasadena in 2016, I booked immediately. I've been lucky enough to have quilts hanging in both shows to date, but with school, I haven't exactly had as much time to quilt these past few years. That meant I had a lack of quilts to submit to QuiltCon. That in and of itself was enough motivation to enter the Michael Miller QuiltCon challenge this year. I will admit, at first the metallic dot fabrics did absolutely nothing for me. I've never really been one to use fabric with dots or metallics, so combining them wasn't exactly motivating for me. At the same time, I had been toying with the idea of framing up flying geese blocks and combining them in some way. Originally I thought about stacking the geese at the bottom of the quilt and arranging them in various heights. Because I made as many geese as I could with the fat eighths provided, I had a ton of geese that allowed me to play with different layouts. One night as I was getting ready for bed, about two nights after I finished all of the geese, which are paper pieced of course, I thought about doing a design where the geese were in the center of the quilt and they radiated out from the center. After playing around a little, this design is what I came up with. 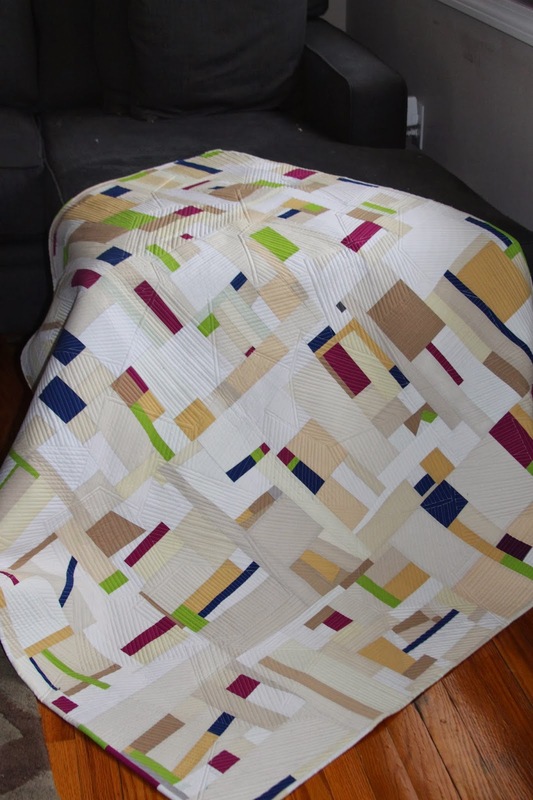 I love Cotton Couture solids, so it was a pleasure working with them with this quilt. I pulled a mint solid from my stash that I have been obsessed over to use as the background. Since I was going out of my comfort zone, I figured I'd pull a different color palette for me. I pulled some solids including mango, periwinkle, watermelon and apricot to go with the mint. Normally I wouldn't pair these colors together, but hey, this is a challenge after all. And of course, because I can't do anything easy, I decided to matchstick quilt this bad boy ONE WEEK before the deadline to submit this to QuiltCon. Smart, huh? Fortunately my guide locks came in for my longarm and I was able to matchstick quilt this using a light green thread, which matched the mint fabric better than the mint thread I had (go figure). I quilted it in one day during a marathon seven hour quilting session while watching some football. Let's just say my back was killing me after I was done, but many it was so worth it. I bound it with the same mint solid fabric because I wanted the flying geese to be the focal point. I didn't want the binding to be distracting. One of the things I love about this quilt and the quilting on it is how the matchstick quilting toned down the harshness of the black fabric and really helped blend it all together. I'm really happy with how this quilt came out and while I'm excited to do more matchstick quilting in the future with my new channel locks, I'm not about to do a marathon quilting session again any time soon.